We were planning on making one of the “Jen Special” dishes that I have previously blogged about (protein, starch, vegetable in their little corners). B found a recipe for quinoa risotto and we decided to try to adapt from that (original recipe). I made a number of different adjustments to this original recipe. First, I cut it down quite a bit. It called for 1 1/2 cups of quinoa so I cut it in half so that it would make enough for dinner and one set of leftovers for two people. Second, I also increased the amount of garlic cause garlic is awesome. Third, I used mozzarella and parmesan cheese instead of the goat cheese due to cheese availability in our apartment. Finally, I added shrimp to the risotto to add some more protein. The only complaint that I had was that it ended up a little saucier than I anticipated. This, however, was due to my own problems with timing. I threw in some more water when I added the shrimp to make sure the quinoa did not get too dry. Unfortunately, the liquid did not evaporate as quickly as the shrimp cooked. Since I didn’t want to overcook the shrimp I sacrificed the liquid level of the risotto. I served with a little bit of balsamic reduction to provide a little bit more flavor. 2 1/4 oz part-skim mozzarella cheese (when I was cooking I was finishing up a bag of Sargento cheese so when I calculated the points it was done with 1/2 oz Sargento Reduced Fat Mozzarella Cheese and 1 3/4 oz part-skim mozzarella cheese). Rinse quinoa in a fine metal strainer until the water turns clear. Spray a skillet with cooking spray. Sauté 1-2 cloves of garlic with spinach until the spinach is tender. Set aside. Heat Smart Balance Buttery Spread and olive oil over medium heat. Add onion and sauté until tender. Add garlic and cook for one minute (make sure garlic doesn’t burn). Add quinoa, wine and cayenne pepper into the pan. Cook until the wine is almost evaporated, stirring frequently. Add broth to cover quinoa. Simmer uncovered over medium low heat. Add broth as the liquid absorbs and stir frequently. Cooking quinoa will take about 15-20 minutes. Stir in approximately 1 lb of the spinach and shrimp in last two minutes of cooking. Remove quinoa mixture from heat and add salt (to taste), pepper (to taste), mozzarella, and parmesan cheese. Stir well. 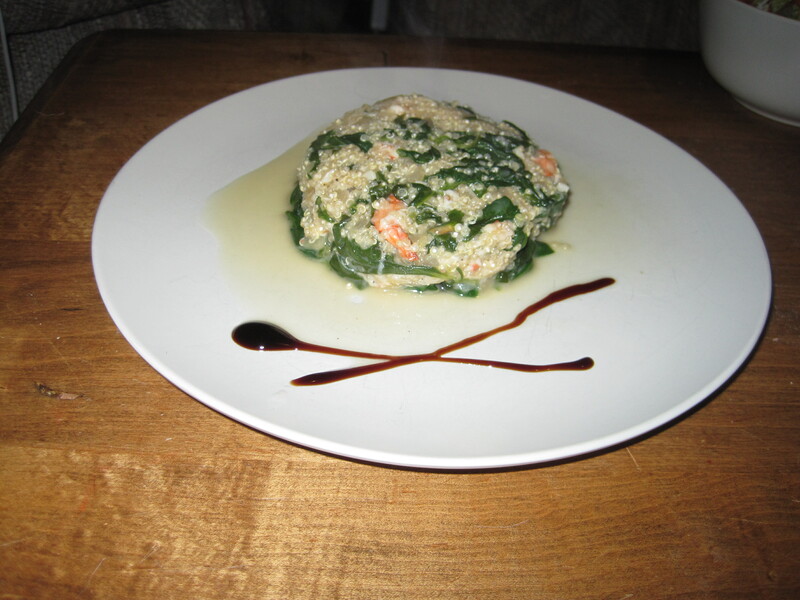 To serve, make a layer of spinach on the plate. 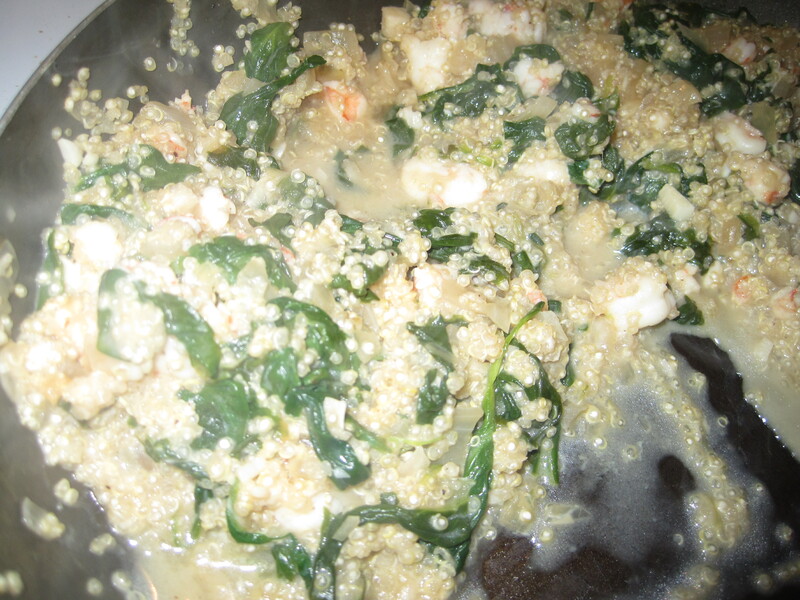 Add the quinoa mixture on top of the spinach. Add balsamic reduction sauce if desired.